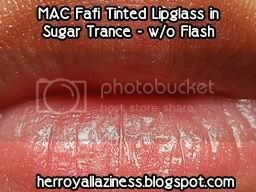 Exclusive to the M•A•C Fafi collection, a specially shaded Lipglass featuring a colourful Fafinette on the shiny black cap. Limited edition. The color is described as a creamy soft pink with white and rainbow pearl on the website, which I felt was rather accurate. 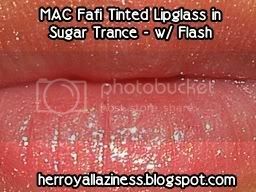 There’s a mixture of delicate gold and silver shimmers which make this lipglass super pretty!! 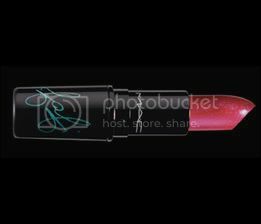 Pigmentation wise – this lipglass is quite sheer. 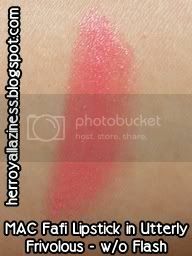 On my pigmented lips the base color cannot be seen at all – only the shimmers are visible. 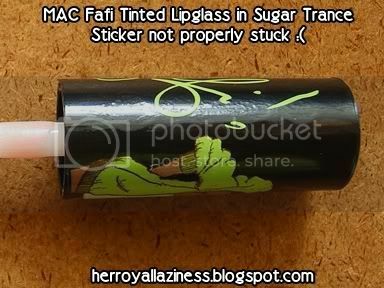 This lipglass comes in a usual clear vial with a black cap – except that this one has a Fafi sticker quite clumsily stuck on the cap (Major Gripe!!)! 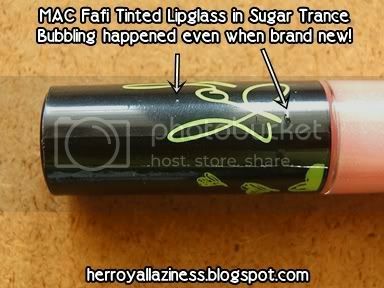 it makes the lipglass look so cheap! :( mine is brand new and already some bubbling has happened! Hmph!!! 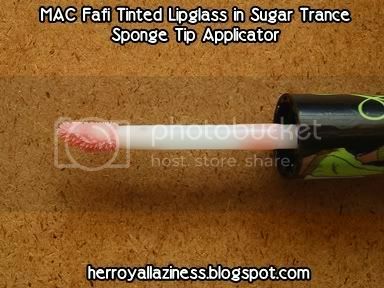 As with all MAC Lipglass, this applies on smoothly! :) No nasty plasticky taste with this one, which is a huge plus! 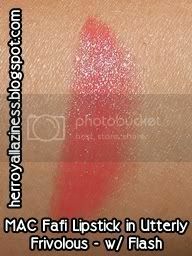 Slightly shorter than the other MAC Lipglasses - this baby lasted only about 2-3 hours on my lips! 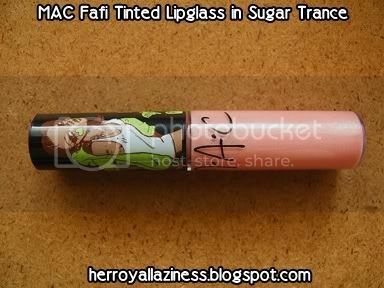 This lipglass is extremely versatile!! 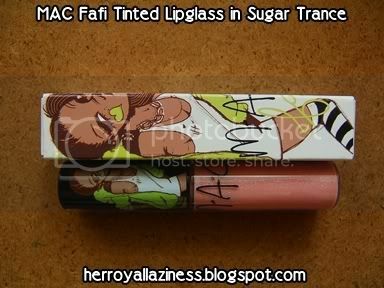 I can use it on its own, or paired over lippie for the extra bling and shine :) this lipglass will not fail to perform! A versatile lipglass that goes with everything! 4.5 Stars ! Near HG Stuff!! Weight: 3g / 0.1 US Oz. Exclusive to the M·A·C Fafi collection, a specially shaded Lipstick featuring a colourful Fafinette on the shiny black case. Limited edition. 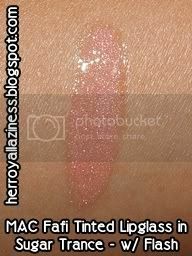 The MAC website describes this shade as a rosy coral with pink pearl. 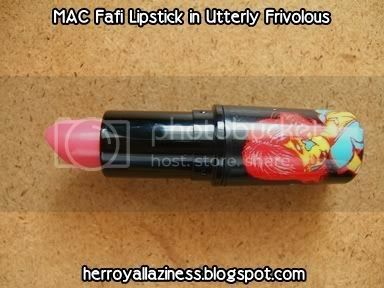 This description is rather accurate in the tube, but on my lips it turns into a pastel barbie pink with pink glitters. The pink pearl described appears as a light fuschia on my lips. Pigmentation is poorer than the average lippie, but buildable. It took me 3 swipes to fully cover the natural color of my lips. 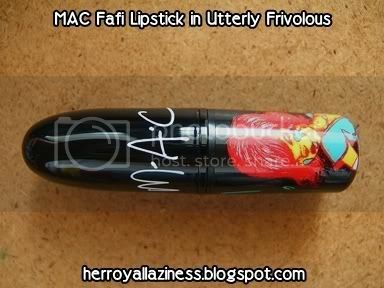 This lipstick looks and works like your regular twist up lipstick, except that it's packaged exclusively with the Fafinette Eriko and the MAC words scribbled on the cap. 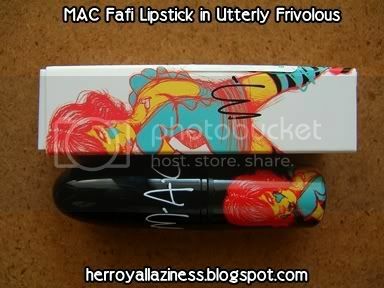 I'm sooo glad that they were printed on the casing itself, instead of stuck on like the Fafi lipglosses! This is a Lustre, so the it doesn't go on as smooth as the glaze ones. 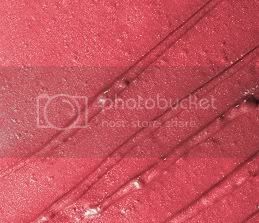 Do remember to exfoliate your lips because this tends to accentuate the flakies. This lipstick lasted about 4 hours on me, which is about average. It's something that's nice to have, but "skippable" if you get what i mean. i'm sure that there are similar dupes out there with better texture. These liners add definition to your eyes with flashes of dramatic colors. Jam-packed with high level of pearlescence, your eyes are guaranteed to shine and light-up in a stroke. 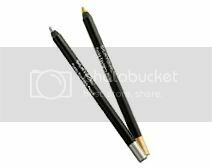 So soft and smooth, these kohl liners will not tug or drag at the eyelids. It can even double-up as an eye shadow. Available in 10 funky shades. Ps: for those who’re not aware of it, Silkygirl is the South East Asian version of Wet n’ Wild (Available only in Malaysia, Singapore and Brunei if I’m not mistaken). 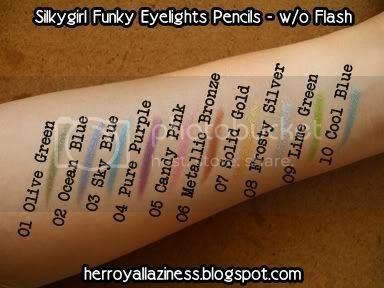 True to their name, these pencils come in 10 different bright colors (see swatch pics below for the name of each individual color). 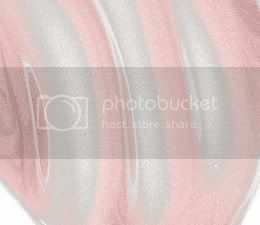 The pigmentation is EXCELLENT – one swipe is all you need to get the color on your lids! All 10 colors are shimmery. These pencils are slightly over 4.5” long and they come with a clear plastic cap (with no groove or whatsoever to hold on, may I add) which sometimes come off. 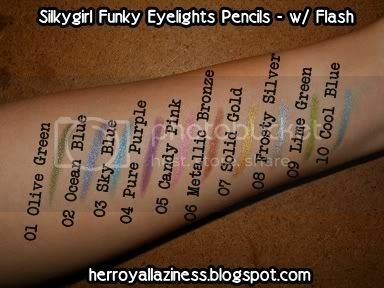 These pencils are very creamy! Though they’re really shimmery but they don’t feel gritty at all! 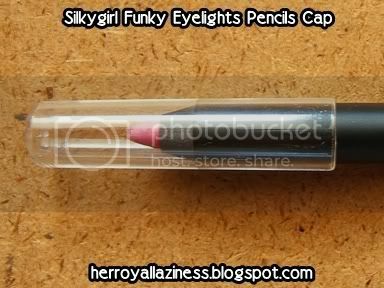 They smooth right onto your eyelids without tugging! As you can see in the picture above, they’re quite soft though, so do use them gently as not to break them! These babies lasted more than 10 hours on me, even after I take a shower! They smudge a little on the inner V though, but it’s quite minimal. 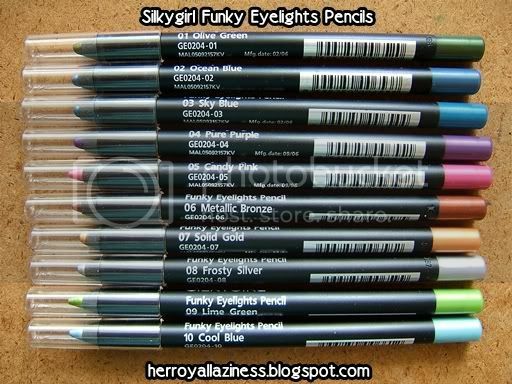 These pencils are sold for RM14.90 (slightly over US$4), which I consider to be dirt cheap! They’re easily available at all Watsons / Guardian outlets or your local supermarket. 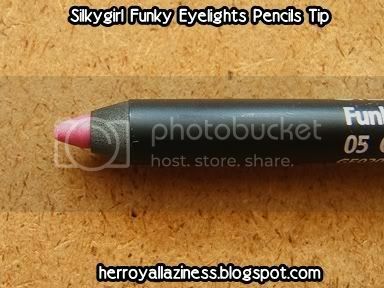 I usually use this to line my lower lids (to match my eyeshadow colors, since powders don’t really last on me). I love using the Frosty Silver shade to line my inner V also. I sometimes also use them as eyeshadows when travelling since they stay on forever (until I remove them, that is!). Excellent drugstore stuff that performs beautifully at a steal!! 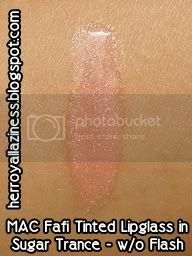 Likes: Excellent pigmentation, Glides on like a dream yet does not budge until you bring on the remover, it goes well with most colors, Cheap, Easily Available. 5 Stars ! HG Stuff! !